Home All About Credit Should You Maintain Separate Accounts When You Get Married? Along with those changes comes the possibility of combining your finances in a joint bank account. While this has long been the traditional and perhaps expected approach for married couples, you might be less inclined to pool your money together straight away, or at all (particularly if you’re the kind who prefers to keep your movie collections separate). What’s the best approach for you and your partner? The answer may depend on the following. Financial Samurai’s Sam Dogen writes for Yahoo! Finance that a sense of independence is one of the foremost benefits of maintaining separate accounts. Having the ability to make small splurges or impulse purchases here and there without being immediately held to account not only helps keep you and your spouse satisfied at an individual level, but it can also help minimize or eliminate potential squabbles over spending habits. Maryalene LaPonsie writes for U.S. News & World Report that independence and autonomy might be particularly important in cases in which you or your spouse are remarrying, or if you are marrying later in life and are already set and comfortable in your methods of financial management. It also prevents one from becoming overly reliant on another managing the finances and keeping all of the gears greased and turning, which can be crucial in the event that a spouse unfortunately passes away. Separate accounts are particularly useful when one or both partners in a relationship are coming in with considerable debt. 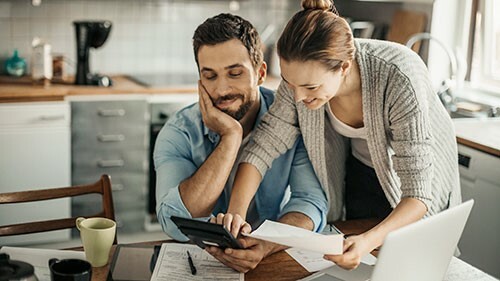 Joint accounts are, as Bankrate’s Roxanne Hawn notes, open to debt collection, liens and judgments or wage garnishments, among other things. This means that your money can be taken by a collection agency to pay against a spouse’s delinquent loans or missed alimony payments. With separate accounts, you can opt to help a partner who’s struggling, but it cannot be done without your knowledge. With a joint account, one spouse does not earn the designation of money manager while the other grabs a seat on the sidelines. By pooling your income into one account, you are both responsible for managing your money and building toward your goals. The Balance’s Jeremy Vohwinkle notes that both account holders will typically be provided with debit cards, checkbooks and online banking access if available. This enables both partners to make deposits, withdrawals and transfers. Because both partners have access to their shared account, it makes it more difficult to overlook financial issues, whether it’s an account being overdrawn or potential identity fraud. This is also quite useful, as LaPonsie points out, in cases where a spouse might become injured or ill and is thus unable to access money to pay for their expenses. NerdWallet’s Tony Armstrong also notes the added layer of insurance that a joint bank account provides. Both account holders are insured up to $250,000 by the Federal Deposit Insurance Corporation or National Credit Union Administration. Marriage is intended to be a lifetime commitment, and there could come a day where you or your spouse pass away before the other. Hawn writes that joint accounts carry rights of survivorship, which make it so that the surviving account holder can obtain the funds in an account without further action. Whether you maintain separate banking accounts, a joint account or both, trust and honesty are essential. You and your spouse should in any case have a frank, realistic conversation about your shared and respective financial goals. No stone should be left unturned, including your expectations for how your spouse will handle saving and spending. Ultimately, this conversation should allow you to decide — as a team — which route you prefer to take together.